History has a new home in Harbor Springs: the Harbor Springs History Museum offers a unique look at the history of the community. Housed in the restored building that was once City Hall and the first Emmet County Courthouse, the new museum looks at the area's first residents, the Odawa, and the Local History exhibit transports visitors through time. Stories of the first Catholic missionaries are followed by those of homesteaders, loggers, and resorters. Wrapping up the experience is a look at how the town and waterfront progressed, the development of the ski resorts and a celebration of Harbor Springs' traditions. In the Discovery Gallery, kids of all ages will be introduced to inventor Ephraim Shay, light keeper Elizabeth Whitney Williams, and postmaster Andrew Blackbird. Visitors also will meet merchants from Harbor Springs early days and step inside a fish shanty for a fun look at wintertime activities. Throughout the exhibits, guided interactive displays allow youngsters to experience topics from Shay's locomotive to the Odawa language. For information about the current exhibit at the Harbor Springs History Museum, read our story: Anishnaabek Art: Gift of the Great Lakes on Display at Harbor Springs History Museum. 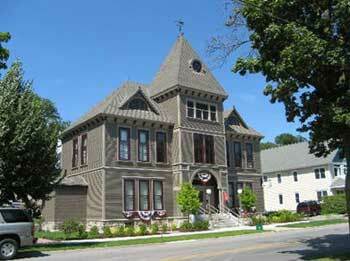 The Harbor Springs History Museum is open Wednesdays-Saturdays during the summer; Fridays and Saturdays the rest of year. It is located on Main Street, across from the Harbor Springs Area Chamber of Commerce.